I can't find a nice pic of my wiring right now, so linking to the wiki instead. 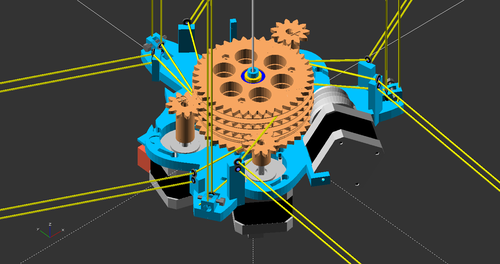 See connection diagram at [reprap.org]. How many jumpers need to be installed under the polulu's? I have all three installed and now I think it is possible that that is too few steps. Three jumpers is 1/16 steps. two is 1/8 one os 1/4 . Oh, the Configuration.h file in the master branch happened to be configured for 1/8 stepping. I guess 1/16 stepping is a more sane default, so I updated that now. I'm excited that you're already configuring firmware. Would you mind posting a picture? 1. ABC conforms to XYZ, I think that A used to be the short one and C the tall one, but I cannot be for sure (I thought I checked the letters on each, but I cannot be sure). I know that I arranged the A and C opposite of each other. Also the D coordinates to E1 E0 is the extruder, I take it. I was trying for a few moments to figure out why I was getting no movement from E0 and now I know. Also in the testing phase a person does not always need all the connectors, a hot end a fan etc. I was more or less just trying to make sure that the hangprinter was not a series of camera tricks (it's not of course), but I neglected to install a hot end thermister and a hot end for that mater, this prevented the unit from moving at all, a good safety measure. So when putting this together be sure to have at least four motors and a thermistor in the hot end spot. Oh one other thing, in your BOM, if you have not already you have to specify the height of the nema 17 motors, I have taller ones and the hangprinter is speced for a shorter, higher torque units. I will post pictures I promise. Give me 24 hours and they will be up. Hi, nice to hear you have progress! I'm don't think all parts will conform perfectly to the new value of Nema17_cube_height, so do visual inspections in OpenSCAD before printing. I'll update the BOM. Edited 1 time(s). Last edit at 03/15/2017 05:49PM by tobben. Tobben, are you still using the same top plate? I saw a top plate from the 2015 version but none in the 2016 version. In the latest blog post I could not see any tope plate. I do not know how to implant a picture in this blog I am learning that process, I have attached my setup. I have elected to have a reasonably stationary installation first, there are a few things I want to print with the unit right off. So I plan to use it like a standard delta if you will. I have setup an old glass table top and secured it with a few screws on three sides. I am waiting on the eyelets so I cannot run the unit currently so no video or pix of that for a few days. I also am going to change the STL file for the ramps holder. I have terrible luck with the screws on the bottom of the NEMA motors, they are soft and I do not know what length to replace them with practically so I am going to see if I can create a holder that can attache with the help of zip ties. Where are the instructions on routing of the filament? For each axis? I can use that information and what is a good average length for the filament to start with? 10 meters 5 meters,considering the routing I would suspect that I would cut a piece of line too short because I have not accounted for the back and forth through the pulleys. Looking forward to hearing from you. Hi, thanks for the pics! Press the questionmark in the upper right corner of the textbox to get help on BBcode (how to include images and such). Lamp hooks are easier to mount than a printed top frame part. It's also easier to unhook your Hangprinter from lamp hooks than from v-bearings. You will probably need to improvise when fastening the D-anchor points because every ceiling is different. I use two 4-5 m long fishing lines on each of A, B and C spools. Once threaded, I tie the two A ends together so I get a continous A-loop of fishing line that is 8-10 m long. Ditto for B and C lines. For D-lines I usually use three 10 m long lines. Edited 2 time(s). Last edit at 03/16/2017 06:01PM by tobben. Actually I will likely be amending the file for the Hang printer because the concept of a hole that has PTFE running through it is much faster for me to execute because the fishing rod accessories are still a full week to fifteen days away. I drilled holes in all of the connection points in the frame. I re-printed the worm drive gear (Turns out the Petg that I used was too flexible). I may reprint all the gears in a stiffer PLA. I may not get it moving this weekend I have some house guests, but I am using the ceiling mount, the measurements are already there, I have drilled the holes and lined them with PTFE, I am not tracking as to why I would need a grooved bearing, but I know I will find out. Nice, making line guides of PTFE is a good idea. LoboCNC had a good experience with such a solution on his rail-less design (see [forums.reprap.org]). I even think it's a good idea to guide the lines all the way from the action point to the spool through PTFE tubes, in order to minimize risk of line being caught by gear teeth. Interesting that you tried Petg. I have no experience with that material. I used Nylon. - Electronics with an SD card reader and maybe Wifi would be nice Minirambo 1.3 with correct firmwhare has SD card reader, automated procedures, pause, change filament and calibration with induction probe. Edited 1 time(s). Last edit at 03/23/2017 03:44AM by Seneko. I didn`t find which settings were used for printing parts of hangprinter? I will use PLA. Which infill did you use? 50% for rigidness? Mini Rambo is a fine electronics design but it has only 4 stepper drivers (RepRap Wiki). You need 5 to drive a Hangprinter. Ca 30% for rigidness is a good idea. Throw in ca 4 top- and bottom layers or more as well. I used ca 20% and it was too little. Lack of rigidity in the bottom plate is a small but noticable problem on my prototype. Edited 1 time(s). Last edit at 03/22/2017 05:56PM by tobben. Noted for prints. Will soon start building one hangprinter. Still need to source some material. I'm very interested in this design! I was thinking when looking at the babel print, why not put the anchor points on the ceiling as well? 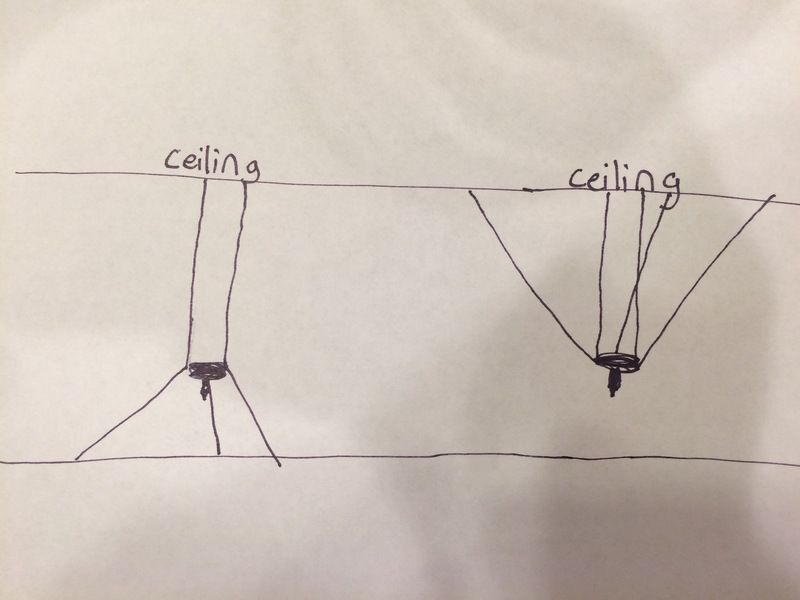 Think of a delta printer with the rods being the string mounted to the ceiling. This would give room for larger and taller prints if someone doesn't have the height needed. Yes it would be more of a permanent fixture. I think it would be a good addition or iteration if it is possible to do. This next Idea would make the build more expensive, but I think a more accurate printer. Add a frame from the center going out to the anchor points to keep the fishing line all the same length. think of an X or a Y frame. I am thinking of this being more of a whole room fixed printer if people want that. Again what I am referring to is having the anchors on the ceiling not floor or walls. Accelerations are limited by gravity. Maximum acceleration is equal to that of a pendulum. Slightly trickier to park in the ceiling when not in use. Sorry, I don't think I understand the suggestion in your second post. Make a mount that people can size for their room so the lines can me equal every print vs. eyeballing the lines when setting up. Wouldn't you need to do measurments when building the frame, just like you must when mounting anchor points already? If anyone is ready to implement these kinematics in the Smoothie firmware, I am ready to send you a free smoothieboard instead of the promise of coding this. Yeah but once you measure it's done. (If the printer is going to be permanent.) Just an idea. You'll need to back-trace the definitions of all variables. The rest of the work is mostly about extending the number of axes/motors (X_AXIS, Y_AXIS, Z_AXIS becomes A_AXIS, B_AXIS, C_AXIS, D_AXIS everywhere). Edited 1 time(s). Last edit at 03/24/2017 03:52AM by tobben. I qwould like to move the kinemaics to Smoothieware. What is the next step. I just wound my spools tonight I ma going to hang the unit this week I hope. I dont think that the fream radiating out of a center point to three points would not be an improvement for stability, I think of forces as forces and monofilament line is STRONG. Furthermore the stiffness of a singular metal hook might rival that of a joined together triangular frame. If you placed he motors on the frame that would give you a lighter carriage with potentially faster kinematic speeds. I will use PTFE on teh Z axis, to avoid teeth interference. I used Made Solid Pet Plus and it was too soft. The gears bend and there are gaps between the snell and the gears such that my filament would creep inside of the body of the gear. So I am reprinting in PLA from Orb Polymer and it is a pretty durable material. Also I will need to reprint my base as well, I made it in PLA with four layers on top and bottom but the base flexes in my hands when I am moving the unit around. No big deal though. Also i am thinking that there needs to be a hole in the base of the unit versus a printed line guide, the tower without a hole in it. I will make the change on my end and repost to github. The github z axis mounts depend quite heavily on the eyelets, and I really think that PTFE is a good thing to try right now, it cuts cost! I love collaboration, thanks for the upgrade. I will print those too. While you are at it, why not place the holes at the angles that relate to xy and z? The holes are right next to each other now, but if they were 30 degrees separated, ti would make the first few turns of the winding easier.